Back in March when I reviewed the early-2009 version of the Mac mini, I concluded that if you’re going to be using the newest mini for more than the most basic tasks, you’ll want it configured more like the $799 model (2GB RAM, 320GB hard drive) than the $599 model (1GB RAM, 120GB hard drive). But I also noted that compared to the $599 model, the $799 model is a poor value. Shelling out the additional $200 for the $799 model gets you only those modest bumps in memory and storage—upgrades that, if you’re comfortable installing them yourself, would cost less than $100 with some frugal shopping. The dilemma is that I was talking about a Mac mini, not a MacBook. Having taken apart previous Mac minis, I knew that many people wouldn’t feel comfortable performing such surgery themselves, so I also recommended an alternative: paying Apple $50 to bump the $599 mini’s RAM to 2GB, and then purchasing an external hard drive for additional storage (and, if you go the FireWire route, additional performance, as well). But part of the beauty of the Mac mini is its compact size. Many people don’t want to expand the mini’s “footprint” by adding an external hard drive. So the two questions I heard most often from Macworld readers and anyone who follows me on Twitter were, “How difficult is it really to upgrade this Mac mini?” and “What about installing a faster internal hard drive?” So I decided it was once again time to get inside the Mac mini—specifically, Apple’s $599 entry-level model—and do some hands-on research. For the upgrade components, I could have purchased a 320GB, 5,400-rpm hard drive for around $65 and a 1GB RAM chip for $20; these would have brought the $599 mini on par with the $799 model for just $684—a whopping $115 less. But I wanted to see what kind of performance increases I could get by upgrading, so I bumped the RAM up to 4GB and installed a drive, Western Digital’s 320GB Scorpio Black, that operates at 7,200-rpm and includes a 16MB cache. This do-it-yourself configuration costs only $747 at current retail prices—still less than Apple’s stock $799 model. Rather than go through the take-apart process step by step, I’ll just give you a quick overview. For in-depth instructions, check out one of the excellent tutorials around the Web. 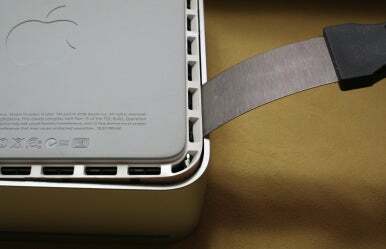 For example, iFixit’s First Look at the Mac mini includes detailed instructions for getting inside, as well as photos of each step. (iFixit also includes some excellent side-by-side comparisons of the internals of the latest mini with those of its predecessors.) If you prefer video, Other World Computing provides both RAM and hard-drive installation tutorials. To make swapping the hard drive as convenient as possible, I recommend buying an inexpensive 2.5-inch SATA case; you can get one for as little as $10. Just before the swap, put the new drive in the case and use SuperDuper or Carbon Copy Cloner to make an exact copy of your Mac mini’s original drive onto the new drive. After performing the swap, your mini will boot using the new hard drive and you can pick up right where you left off. You can then put the original drive in the drive case and use it as an external hard drive. Opening the case: Easily the most gut-wrenching part of the process, this step requires you to flip over the mini, insert a thin putty knife between the mini’s aluminum top case and its white-plastic base, and then pry past the point where you’re sure you’re going to break something; you work your way around the base of the mini with the putty knife until you've released all the plastic clips holding the top and bottom together. (The first time I opened a mini, this step took me at least half an hour because I thought I was doing something wrong. While writing this article, I took the new mini apart again for some photos and realized it took me only 10 seconds or so to pop off the top. Practice makes perfect.) If you’re careful, the only evidence that you’ve been inside the mini will be a few tiny marks in the plastic or metal from the edge of the putty knife, and even those marks will be nicely hidden from view on the bottom of the mini. Watching OWC’s video gives you a good idea of how much force is necessary to apply to your putty knife. Detaching antennas: There are three antennas clipped atop the mini’s innards. You remove two by gently pulling them upwards; the third requires you to squeeze a plastic clip underneath. Removing screws and detaching the connector cable: Four small screws hold the mini’s drive assembly—the optical drive, hard drive, and fan—in place. After removing these screws, you gently disconnect the small ribbon cable connecting the drive assembly to the rest of the mini’s components. You can then lift the drive assembly, exposing both the hard drive (on the underside of the drive assembly) and the RAM slots (on the bottom section of the mini). No further tools are needed to install or swap RAM. To swap the hard drive, you need to remove four standard drive-sled screws. The only hitch here is a small temperature sensor attached, using adhesive, to the edge of the hard drive; you’ll want to carefully remove it, swap the drive, and then reapply the sensor to the same location on the new drive. Putting the mini back together is as simple as reversing your steps. You can take solace in the fact that putting the mini’s top case back on is a much simpler process than removing it. You just line it up with the base and then squeeze the two pieces together. It took me less than half an hour to swap our mini’s RAM and hard drive, including stopping occasionally to take photos. For someone who’s never performed the procedure before, I’d set aside an hour or so. Interestingly, I found the current mini to be easier to take apart and put back together than some of the previous versions. For example, I needed two putty knives to open the original mini. Similarly, when putting the case back together, the original mini had metal shielding that had a tendency to get caught on the top case; this isn’t a problem on recent models. While I'm on the topic of digging around inside the mini, the folks over at Macminicolo.net documented their own takeapart earlier this year. One of those photos revealed what appears to be eSATA circuitry inside the mini. Perhaps we’ll be seeing eSATA connections on future models? You can save some money by buying RAM and a hard drive separately and installing them yourself, but how does the resulting configuration compare? After all, if you don’t get better performance, all you’re gaining by going the DIY route is $50 in savings (at least using the components I chose). Many people would be content paying that difference just to avoid the installation hassle. So I handed off our upgraded Mac mini—now with 4GB of RAM and a 7,200-rpm hard drive—to the Macworld Lab to put the machine through our standard suite of benchmark tests. Coincidentally, the Lab was also testing Apple’s maxed-out mini, which is the $799 model custom-configured with a 2.26GHz processor and 4GB of RAM—upgrades for which Apple charges $250, bringing the total cost to a staggering (for a Mac mini) $1,049. Below are the benchmarks for five Mac mini systems: the $599 model with 2GB RAM (some of our tests don’t work with only 1GB), the stock $799 model, the 2.26GHz model with 2GB RAM, the 2.26GHz model with 4GB RAM, and, finally, our DIY model. Speedmark 5 scores are relative to those of a 1.5GHz Core Solo Mac mini, which is assigned a score of 100. Adobe Photoshop, Cinema 4D XL, iMovie, iTunes, and Finder scores are in minutes:seconds. All systems were running Mac OS X 10.5.6 with 2GB of RAM. The Photoshop Suite test is a set of 14 scripted tasks using a 50MB file. Photoshop’s memory was set to 70 percent and History was set to Minimum. We recorded how long it took to render a scene in Cinema 4D XL. We used Compressor to encode a 6minute:26second DV file using the DVD: Fastest Encode 120 minutes - 4:3 setting. In iMovie, we applied the Aged Film Effect from the Video FX. menu to a one minute movie. We converted 45 minutes of AAC audio files to MP3 using iTunes’ High Quality setting. We duplicated a 1GB folder, created a Zip archive in the Finder from the two 1GB files and then Unzipped it. Prices are for Apple Store purchases (except for DIY model). To compare Speedmark 5 scores for various Mac systems, visit our Mac Hardware Guide.—MACWORLD LAB TESTING BY JAMES GALBRAITH, CHRIS HOLT, AND HELEN WILLIAMSON. Although I didn’t get any hands-on time with the 2.26GHz models, the DIY mini also feels subjectively snappier when compared to its original configuration, especially if many programs are running and when performing tasks involving the hard drive. And despite concerns that maxing out the mini’s RAM and installing a faster hard drive might result in higher internal temperature—and, thus, more fan noise—the mini remained relatively cool. For example, after more than an hour of constant drive access, the mini’s internal temperatures increased by fewer than 20 degrees (Fahrenheit); and even when the fan did kick in, it was barely audible from just a couple feet away. In my review of the mini, I contended that it’s tough to justify purchasing the $799 model. Buying the $599 model and upgrading the RAM (either as a build-to-order option or on your own after the purchase) and hard drive (either internally or by connecting an external drive) is a better way to go. After performing those very upgrades and comparing the results to both the stock mini models and Apple’s top-of-the-line upgraded mini, that argument is even more compelling. Even if you pay a local Apple guru to install your additional RAM and larger (or faster) hard drive, you’ll likely end up spending not much more than the cost of the $799 mini for a considerably more capable machine. As for Apple’s build-to-order 2.26GHz processor upgrade, that option seems like an even poorer value when compared to our $747 DIY mini. Unless you specifically need the additional processor speed—in which case, the mini probably isn’t the best Mac for you anyway—you should instead consider less-expensive options…such as, say, more RAM and a faster hard drive.